Arsenal will be keen to collect all three points when they travel to take on Bournemouth at Vitality Stadium on Sunday, as they are fighting to grab a top 4 place. 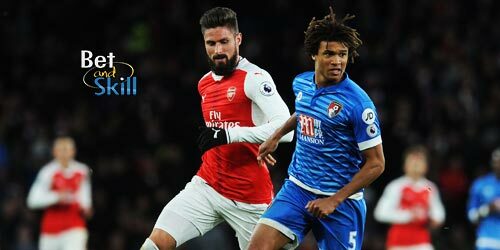 Don't miss our Bournemouth vs Arsenal betting preview with expert predictions, betting tips, lineups, team news, enhanced odds, betting offers and no deposit free bets for the Super Sunday match! Bournemouth have won only one of their last 12 competitive matches but are enjoying a 4 match unbeaten run, scoring 9 goals in the process. Anyway, they remain reliably shaky at the back too, their last clean sheet coming all the way back in November. The Cherries sit 16th in the EPL standings, just 1 point above the relegation zone. In terms of direct matches against Arsenal, Eddie Howe's men are yet to beat the Gunners in the Premier League, picking up one point of 15 available courtesy of a 3-3 draw last year. Plus, they have always conceded either two or three goals against Wenger's men. Eddie Howe revealed both Josh King and Junior Stanislas are doubts and need to be assessed while Jermain Defoe is sidelined. As a result, Benik Afobe and Callum Wilson are likely to lead the line in a 4-4-2 starting system. Lys Mousset, who scored in the FA Cup, offers another alternative. Ryan Fraser and Jordon Ibe should continue out wide, with Andrew Surman and Lewis Cook anchoring the midfield. The four man backline should be formed by Charlie Daniels, Adam Smith, Steve Cook and Nathan Akè. The likes of Tyrone Mings and Adam Federici miss through injury. Arsenal are undefeated in the seven league games since losing to Manchester United at the beginning on last month, but they have won just one of their last 4 Premier League fixtures. The Gunners currently sit 6th in the table, 5 points shy of Liverpool in 4th. In midweek, they managed to draw at Chelsea (0-0) in the EFL Cup semifinal 1st leg. Prior to that, they were knocked out of the FA Cup by Nottingham Forest (4-2), a shocking loss which ended their defence of the title. Away from home, Arsene Wenger's side have failed to win 11 of 16 matches in all competitions. The reverse match at Emirates, saw Arsenal win the clash 3-0 back in September. Last season's 3-3 draw at the Vitality had the taste of victory for Wenger's side, given that the Cherries had led 3-0 with 70 minutes played. Jack Wilshere suffered an ankle sprain in midweek and is a major doubt. With Francis Coquelin departing for Valencia, Mohamed Elneny is a viable option in the middle of the park. Anyway, Arsene Wenger has been boosted by the return of Aaron Ramsey. In defense, Laurent Koscielny and Nacho Monreal remain out and will be replaced by Rob Holding and Calum Chambers. Hector Bellerin and Ainsley Maitland-Niles should continue as the wing-backs, given Sead Kolasinac is still in the treatment room. Up front, Mesut Ozil will be assessed ahead of the match, though the German is expected to feature alongside Alexis Sanchez behind Alexandre Lacazette. Olivier Giroud remains out, while Santi Cazorla is a long-term absentee. "Bournemouth vs Arsenal predictions, betting tips, lineups and free bets (Premier League - 14.1.2018)"